We had some fun at the Reid Park Zoo in Tucson in between Barber shows. Colin and Miss L loved their maps. We stumbled upon a talk by Jane Goodall, but with 5 kids, no time to stop and listen. 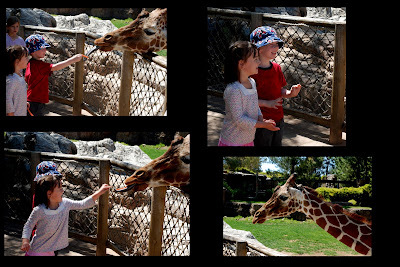 The 4 year olds got to feed the giraffes! They were delighted. All the kids near the end of our visit. Both 4 year olds still holding on to their maps, funny kids!